In Moral's case, the court ruled that the prosecution failed to establish that there was "unlawful taking" of the documents stored in Vaults 1 and 2 of the FAD's rare manuscripts section. Since the prosecution had fallen short of producing the required quantum of proof, the court said Moral was presumed innocent and must therefore be set free. "This leaves the court with no option but to acquit Moral for insufficiency of evidence, at the very least, on reasonable doubt," said the court. The case basically began as a power struggle between [Maria Luisa] Moral and [Adoracion] Bolos shortly after the latter assumed as acting director [of the National Library] in 1992. Bolos, a former chief of the Filipiniana and Asia division herself in the 70s, sought an inventory of rare books and manuscripts shortly after she assumed as acting director of the Library. Bolos created an external committee to conduct an independent inventory at the FAD. However, in an exchange of memos between Moral and Bolos, Moral, then the chief of the division, objected to the move, saying it was just a "waste of management" and "not in the interest of the service." She also questioned the external committee’s creation, saying it was merely meant "to harass the FAD, which did not support you in your quest for the directorship." There is more to this case than meets the eye. It is misleading—and unfortunate—that the case is portrayed as a power struggle that just happened to reveal that documents were being stolen from the National Library. As far as I can tell from the old reports I've read, the pilferage was already taking place in the 1970s—and maybe even earlier. Here's hoping the judge lays out all the facts in her decision and we get to read it in its entirety. Anywhere I go, I look for Filipino librarians. Sometimes, they find me. Eventually, I am able to "collect" enough to invite them to get together. That's how I got photos of Filipino PhD students and Pinoy bibliobloggers. Now I can add the Filipino librarians in Toronto to my list. But strictly speaking, not everyone in the photo is or will be a librarian. Although five of us already have our MLS or MLIS, only Sonny is working as a librarian. Annella and Lea are archivists, Beth is known as a research specialist and I'm a PhD student who is a "librarian" nowadays only on this blog. John and Ryan are still finishing their degrees, but John with his IT background will most likely not work as a librarian, which leaves Ryan, who is now working part-time in a library, as the one most likely to join Sonny as a full-time librarian. Since not everyone is a librarian, I was thinking that maybe we could call ourselves Filipino Librarians and Archivists in Toronto (FLAT), but that doesn't seem to be very, um, flattering. So I thought of Filipino Information Specialists in Toronto (FIST), which the archivists agreed also covered them, but which sounds too militant to me. 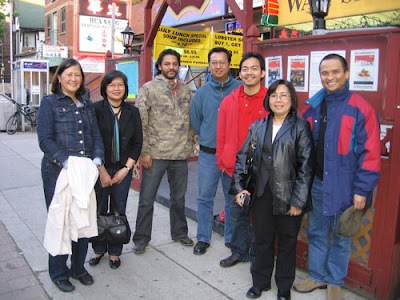 Then there's Filipino Library and Information Professionals in Toronto (FLIPs-Toronto), which tends to give the impression that there's a larger organization somewhere. Any suggestions? 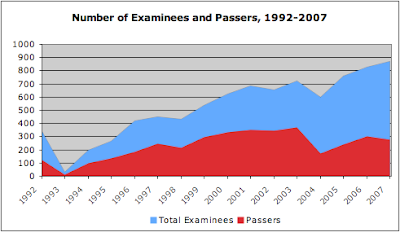 The number of those taking the exam has clearly increased almost every year for the last sixteen years. But the number of passers has not gone up proportionally, and even decreased in terms of percentages in the last four years compared to the earlier years. These, however, do not necessarily mean that there has been a corresponding increase in the number of students interested in becoming librarians or that they have not been performing as well as those before them. Based on the 2007 results—the only one that provides a breakdown of first-timers and repeaters among those since 2002 that I have been able to download from online sources—almost 45 percent of those who took the exam were repeaters, less than a fifth of whom passed. Aside from inflating the number of those taking the exams, the high number of repeaters who do not pass also pull down the passing rate. This merely emphasizes the need to distinguish between first-timers and repeaters when analyzing the results. There is, however, another reason for the relatively steep decline beginning in 2004. From 1993 to 2003, the passing rate was almost consistently at 50 percent. Now it's in the 30s. The fall, as explained to me by a board member at the induction ceremonies in 2004, was due to a shift from using the mean in computing grades to a system that was being used by all other professions for which the Professional Regulation Commission (PRC) administered exams. In short, the previous passing rate was artificial. But the year 2004 was also the year when brownouts at the main testing center and explosions outside distracted those taking the exam, which perhaps explains why the lowest passing rate ever was recorded that year. The list of schools with the highest passing rates and the highest number of examinees is available from 2002 onward, but this does not really tell us much because these schools do not even account for half of all examinees. A closer look at the detailed lists from 2006 and 2007 reveals that examinees came from 105 and 129 schools, respectively, and that only 30 schools each had more than 10 students taking the exam per year. In 2007, 99 schools with ten students or less accounted for one-third of the examinees, and of the 50 schools that had only one graduate taking the exam, only 17 passed. If UP's passing rate looks exceptional, it is. No other school with more than 15 students had a passing rate higher than 60 percent. It also had the lowest number of repeaters—just one—which means that repeaters had very little to do with its high number of examinees. And this is true not only of the 2007 results—UP has consistently had the highest passing rate since the exams started in 1992. What does UP have that other schools don't? (Note: I obtained my MLIS at UP and taught there for one semester, but don't really have any basis for making any comparisons, so what follows are merely possibilities for further research, not conclusions.) Could it have something to do with the admission process? Or maybe many—most?—of the schools don't really have enough faculty, facilities, or funding to adequately cater to the needs of their students? This leads to another question: Do we really need so many library "schools" in the Philippines? If some of those in the same region, province or city pooled their resources, would it lead to better results? I am not in a position to take this any further, but I hope someone will find this interesting enough—or maybe even get so offended?—that they will do more research to prove that my data is wrong or that I'm not asking the right questions. The data used for this post are from the files sent by the PRC to different newspapers in 2002, 2003, 2004, 2005, 2006, and 2007; and those for 1992-2001 are from "The professionalization of librarians in the Philippines" (pdf) by Antonio Santos. Are you on Friendster, Facebook or other social networking sites? Well, if you're a Filipino librarian, you should be on FilipinoLibrarians.org, too. If you're a regular reader of this blog, but are not part of any social networking site, why not try setting up an account at FilipinoLibrarians.org? On FilipinoLibrarians.org, you can set up your own blog, upload photos and videos, communicate with other Filipino librarians around the world and see for yourself why social networking has become so popular in the past few years. You may not see the need for social networking now, but librarians around the world have already begun experimenting with these sites as a means to create a presence for the library where its users already are. I personally think it's a good way of shattering stereotypes about librarians. "Social networking for libraries a bust?" (Sarah Houghton-Jan) - note: read the comments! Who Would Want to Kill a Librarian? "So you think someone killed him? Who could possibly have a problem with Jonathan? He was a librarian." "It's not like librarians don't have enemies," Caleb said defensively. "Indeed, I've been around some colleagues who can get pretty mean-spirited after they've had a few glasses of merlot." She looked at him incredulously. "Yeah, I bet. But no one's going to pop someone because they got fined for an overdue book" (hardbound, p. 197). It's not the greatest book in the world, but Baldacci's novel reminded me that while I've written about the image of librarians in movies, I haven't done the same for librarians in novels. Let me do something about that now. If you want a brief overview of what's available, there are "Cool Librarians," which includes the protagonists in two Harlequin romances among the four books it recommends, along with the other fictional and real librarians it features; and "Spectacles - How Pop Culture Views Librarians," which lists four series with librarians as "detectives" among the books it covers in a review of the librarian's image in movies, music, TV, books and comics. Then there's BiblioMystery, which provides the titles of mysteries in which "books, manuscripts, libraries of any kind, archives, publishing houses, or bookstores occupy a central role, or mysteries in which librarians, archivists, booksellers, etc. are protagonists or antagonists." Its companion site on LibraryThing allows browsers to read reviews, search for specific titles, and look at book covers. Finally, if you're the academic type, there's "Librarians in Fiction: A Discussion" by Christopher Brown-Syed and Charles Barnard Sands, an article that "explores portrayals of librarians in selected works of fiction, notably those involving mystery or detection." Unfortunately, no similar listings seem to be available online—and most likely, even in print—for librarians in Filipino literature. If you know of any such books, leave a comment below, and maybe we can make our own list. Just in case you're wondering whether the title of this post has any basis in reality, see "Seattle School Librarian Murdered" by Laura B. Weiss (School Library Journal, 8/3 Aug 2006). In his book, “Teacher and Machines: The Classroom Use of Technology Since 1920,” Larry Cuban noted that even with so much money invested in technology, only 2 of every 10 teachers are serious users of computers in their classroom and 3 to 4 are occasional users (about once a month). The rest never use the machines for instruction. This is the beginning of an article that is obviously from a speech read at the commencement exercises of the UP School of Library and Information Studies (SLIS). It was probably edited to fit the space available, which may have caused some of the problems I raise here, but I doubt it. Because of the way it began, I thought the article was going to go into the digital divide, but it ended up being about the personal qualities needed "to meet the challenges of serving our people as an information professional." I suppose this just goes to show that there are limits to what can actually be said at a commencement address. More unforgivable, in my opinion, is the fact that she got the old and new names of UP SLIS wrong. The worst, however, is the constant reference to "he." While I wish there were more male librarians, the reality is very different, as the photo above shows. The female author is obviously not a feminist. By the way, congratulations to the new graduates! Before you continue reading, you should know that clicking on any of the links in this particular post may lead to difficulties finishing whatever you need to do. I should know, I got hooked on a few series, and just couldn't stop until I had seen all the episodes from the very beginning. If you keep on clicking, you'll discover that some content from the sites that the links lead to are not all listed on alluc.org. Two that I've found particularly good are Video Space and Videostic.com. The former has the first season of "Dawson's Creek," which is not even available on DVD, while the latter has all the seasons of "Friends" and the latest episode of "American Idol," in case you missed it the night before.